McCloud, a rookie sixth-rounder out of Clemson, caught five of just six targets for 36 yards and no touchdowns over 10 games. He also returned one kickoff for 18 yards and four punts for 20 yards. McCloud is active for Sunday's game against the Jets, Chris Brown of the Bills' official site reports. McCloud could earn more work on offense over the final quarter of the season after the Bills waived fellow wideouts Kelvin Benjamin and Andre Holmes this week, Kyle Silagyi of the team's official site reports. "It's an opportunity for me, an opportunity for the team," McCloud said. "Just help us grow the future and develop for future years just to see what we're all about." Analysis: McCloud hasn't played the last two games after a series of disappointments on offense and special teams. Since the Bills are using the last four games as an audition for 2019, it seems likely the sixth-round rookie will get some more looks before the campaign concludes. Zay Jones is the clear-cut No. 1 option at receiver, while Robert Foster and Isaiah McKenzie seem to be next in line. It's uncertain if McCloud or veteran Deonte Thompson is the fourth man at the position. McCloud was one of the team's inactives for Sunday's win over the Jaguars. McCloud was unable to haul in his lone target during Sunday's 41-9 loss to Chicago. Analysis: The rookie has recorded multiple touches just once this season in a Buffalo offense where value is incredibly hard to find. Nathan Peterman threw three more picks Sunday in the comedy of errors that Buffalo has started at quarterback. Derek Anderson (concussion) might be the guy in Week 10, but a trip to visit a Jets defense among the best in the league at generating turnovers likely makes McCloud a non-factor. McCloud (undisclosed) was removed from the injury report and will be available to play Monday against the Patriots. Analysis: The rookie didn't make the trip to Indianapolis in Week 7 because of an undisclosed reason. It's at least worth noting the Bills pulled the rookie from return duties after he fumbled twice on returns in Week 6 against the Texans. McCloud and the team have seemed to move past the issue, but it's unclear what sort of role McCloud will have Monday. McCloud (undisclosed) did not travel with the team and won't play Sunday against the Colts, Chris Brown of the Bills' official site reports. Analysis: McCloud didn't make the trip for an undisclosed non-injury reason. Specifics of the issue remain unclear as the 22-year-old will perhaps be ready for a return in Week 8 against New England. It's at least worth noting the Bills pulled the rookie from return duties last week after he bumbled two returns, which ended up putting the team in a hole against the Texans. Armstrong caught his lone target during Sunday's 20-13 loss to Houston, gaining two yards. He fumbled twice during the contest, losing one. McCloud recovered from a knee injury and made his NFL debut in Sunday's upset win over Minnesota, catching his only target for six yards while returning one punt for 13 yards. Analysis: McCloud saw action on 14 offensive snaps, but it's likely special teams where the rookie will make his most immediate mark. Considering McCloud was the only Buffalo player to return a punt Sunday, it looks like that's his job to lose for the foreseeable future. McCloud (knee) is active Week 3 against Minnesota. Analysis: McCloud logged a full practice Friday after being limited the first two days of the week, suggesting he would be ready for his pro debut. It's unclear what, if any, role the sixth-round pick will have in the passing game, but the former Clemson wideout could factor in the return game. McCloud (knee) practiced on a full basis Friday after being limited the first two practices of the week and is listed as questionable for Sunday's game in Minnesota, the Bills' official site reports. Analysis: This is probably the healthiest the rookie has been since the regular season kicked off, so he has a good chance of making his pro debut this week. If that happens, McCloud would likely factor in more on special teams than the passing game, at least until he starts getting his feet wet with the offense. McCloud (knee) practiced on a limited basis for the second straight day Thursday, the Bills' official site reports. Analysis: Given that McCloud was close to suiting up last week and has resumed practicing in limited fashion, we wouldn't be surprised if the rookie gets to make his NFL debut Sunday in Minnesota, where he might get a chance to shine in the return game. 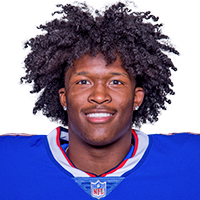 McCloud (knee) is inactive for Sunday's game against the Chargers, the Bills' official site reports. Analysis: The rookie will have to wait until at least Week 3 to make his pro debut, while the Bills will operate against the Bolts with just four healthy wideouts. McCloud (knee) returned to a limited practice Friday. Analysis: That breaks the rookie sixth-rounder's string of five straight absences and led to McCloud being listed as questionable for Sunday's game against the Chargers. There's not much short-term fantasy upside here, but given the state of the Bills' passing game it's not out of the question that McCloud could gain modest utility as the season rolls along if he's able to click with Josh Allen, the team's new starting QB. McCloud (knee) was limited at Friday's practice and is listed as questionable for Sunday's game against the Chargers, the Bills' official site reports. Analysis: Even if he suits up Sunday, McCloud isn't expected to have much of a role in the offense unless injuries strike, but the Bills would love to see him contribute in the return game. McCloud (knee) didn't participate in the Bills' practice Wednesday. Analysis: McCloud sat out the Bills' season-opening 47-3 loss to the Ravens after failing to practice at any point last week and isn't starting off Week 2 preparations on a positive note. He'll have two more opportunities to prove the knee injury he suffered in the preseason is behind him, but McCloud likely won't have much of a role on offense even if he's cleared to play Sunday against the Chargers. McCloud missed practice again Friday due to a knee injury and has been ruled out for Sunday's opener in Baltimore, Chris Brown of the Bills' official site reports. Analysis: The Bills kept five other receivers on the final roster, all of whom are healthy, so the offense won't suffer at all. However, McCloud is expected to have a big role in the return game, so the team will need to look elsewhere for the contest against the Ravens. McCloud (knee) isn't taking part in drills during Thursday's practice, Joe Buscaglia of WKBW.com reports. McCloud (knee) didn't practice Wednesday, Chris Brown of the Bills' official site reports. Analysis: McCloud suffered the knee injury while returning a punt during last week's preseason finale against the Bears. The sixth-round rookie out of Clemson made the Bills' 53-man roster despite the health scare, but will need to recover quickly to maintain his spot as a depth receiver. It remains to be seen what sort of role -- if any -- McCloud will have on offense in 2018. McCloud injured his knee on a punt return during Thursday's preseason game against the Bears and will not return to action, Chris Brown of the Bills' official site reports. Analysis: This could be horrible timing for the sixth-round rookie from Clemson, as he's thought to be in a close fight for one of the final receiving spots. McCloud is currently battling for a roster spot, Mike Rodak of ESPN.com reports. Analysis: The rookie out of Clemson figures to be at best the fifth option at receiver currently. McCloud was hoping to carve out a role as a returner but has fallen behind both Taiwan Jones and Jeremy Kerley in that department. While these last few weeks of practice remain imperative for his chances of making the roster, the final two preseason contests will likely carry added weight as well. 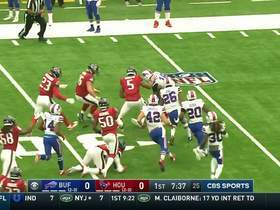 Houston Texans linebacker Brennan Scarlett recovers fumbled ball from Buffalo Bills wide receiver Ray-Ray McCloud for a turnover.